In years gone by, women were discouraged from participating in physical activity, especially sports. Back then, men and women alike thought: only men should play sports, women might hurt themselves by doing too much physical activity, women should wear respectable clothes that covered most of their bodies (i.e. not shorts and swimsuits etc), women should stay at home and look after the children and house. Things have improved a lot since then. The involvement of women in sports is increasing all the time as it is now accepted that women are just as capable and have the same rights as men to exercise and stay healthy. Specialist women's gyms and women-only sessions are also widespread. Sport-Tek encourages women to live their lives to the fullest in all sports. Sport-Tek captures the spirit of true athletic styling with unique fabrics, modern design and a trend-right colour palette. In addition to fashionable colours found in the latest retail designs, Sport-Tek styles are available in most popular team colour combinations. The Sport-Tek collection ranges from performance apparel to athletic heritage and casual streetwear. Sport-Tek is perfect for schools, teams, resorts, community organizations and the corporate world. 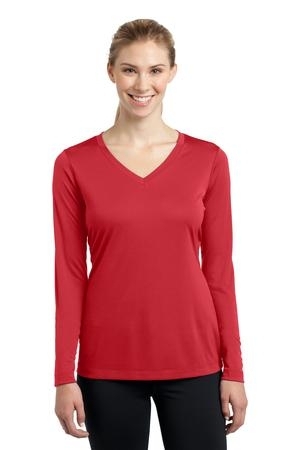 Sport-Tek’s Ladies Long Sleeve V-NeckPosiCharge Competitor Tee exemplifies everything we stand for. It is ideal for indoor or outdoor sports. The long sleeves and V-neck is a classic look which can be worn at any occasion, whether it be at yoga, golf, shopping or lounging around the house. The amazing colour range is perfect for any sports team or brand as the tops are also easily customizable. The colours are as follows; Black, Hot Coral, Iron Grey, Lime Shock, Pink Raspberry, Silver, True Navy, True Red, True Royal and White. This colour range shows great versatility; where the True Red is very popular with sport teams, the True Royal is very popular with organisations and companies. Sport-Tek’s Ladies Long Sleeve V-Neck PosiCharge Competitor Tee is easily cared for too; machine wash cold with like colours, non-chlorine bleach only if needed, do not use fabric softener, tumble dry low, remove promptly, cool iron if necessary, do not dry clean. Ladies sizes go from XS, S, M, L, XL, 2XL, 3XL and 4XL.